Warning: your browser was not able to load the Style Sheet of this website. Therefore, your browsing experience will not be as convenient as it was intended by the author. The availability of correct ground truth information is critical to many experimental scientific activities. In particular, the accuracy in determining the application and protocol behind each flow in an Internet traffic trace is necessary to allow advances in Internet measurement research, such as the study of new traffic classification mechanisms. gt is a software suite for associating accurate ground truth information with Internet traffic traces. By probing the monitored host's kernel to obtain information on open Internet sessions, gt gathers guaranteed truth at the application level. gt has been designed and developed by the NTW team in cooperation with Politecnico di Torino, with further contributions from CAIDA. gt is distributed under the classical BSD license. Please see also the LICENSE file, included in the distribution. Please note that this version of gt is provided "AS IS" with no warranty whatsoever (see the LICENSE file), is intended for purely experimental and research purposes, and should be considered alpha-quality. 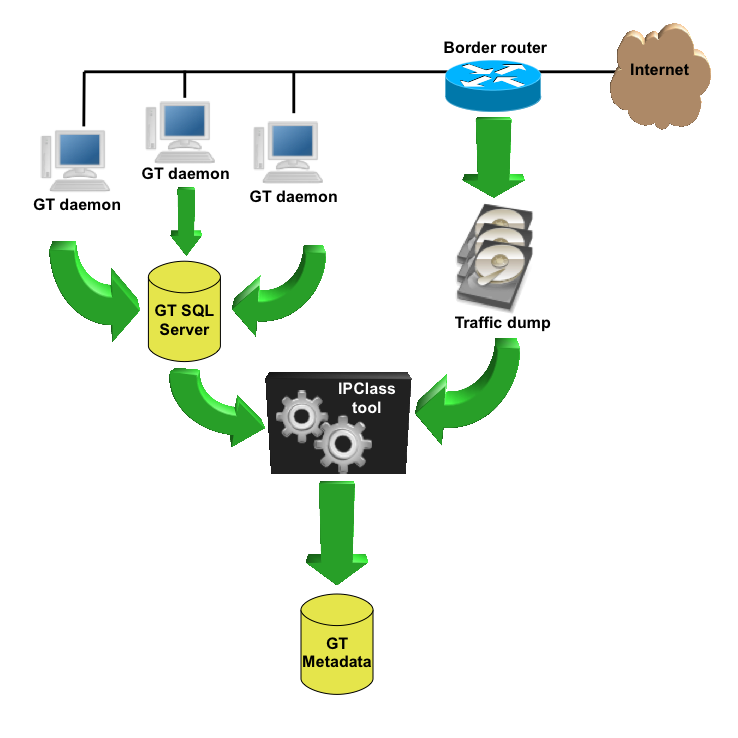 The gt client daemon (version 0.0.1, tar.gz file, 132kB). The ipclass post-processing toolset (version 0.0.1, tar.gz file, 28kB). Last modified: Thu Oct 8 10:47:15 CEST 2009. Comments? send us an e-mail. Copyright © 2003-2005 Università degli Studi di Brescia. All rights reserved.